Sometimes it's hard not to step into a victim mentality. Sometimes it seems like it's only fair to allow ourselves to live in self-pity and resentment for a while, but in truth. it's never ok.
Let me be the first to tell you though, I sure have felt victimized at times and working to keep peace during those times is HARD. It's so difficult to look beyond the hurt and insult that we want to feel and turning our eyes to Christ. Christ who WAS a victim, a victim of our own sins, but who never stepped into the role of a victim. He lived above self-pity and angst even though he genuinely did nothing wrong, or anything to deserve the rumors or treatment that were thrown at him. I can tell you that at times in life, you WILL be a victim. You will be the brunt of something whether it's bullying (at school or work), unfair treatment, misunderstanding, etc. It WILL happen. The way that we respond is so important no matter what is going on though. If it is a friend that you are feeling victimized by, first thing is talk about it with them if it seems to be a fair conversation. But maybe it's something that you just need to process on your own. Maybe it's just the perception of the situation that needs changing and although it feels like the treatment is purposefully to abuse you, it might be all in how you are looking at it. Please Note: If you are being abused physically, mentally, or emotionally by someone, I am NOT excusing that. PLEASE seek help for yourself in that case!!! 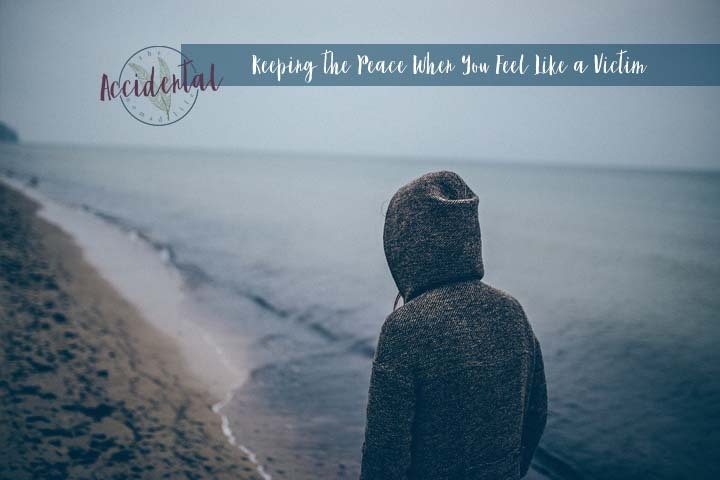 I am talking about instances of allowing ourselves to be hurt by friends, or to look past what COULD hurt us and being gracious in our response. This is not saying to live under abuse, but to do good to others even when we feel hurt by them. If we feel that someone is treating us wrongly, we can still stand up for ourselves when the occasion calls for it. Pray before approaching the person. Make sure that your heart is ready to be gracious and know that the person might not be sorry at all. Maybe they don't realize what they've done, or how they've hurt you. Just be prepared to accept that even though you present them with the truth of how you're feeling, they may not grasp it for themselves. Just know that by approaching things through Grace and through Prayer, Jesus will be your advocate. I am feeling so slighted right now by, ______________________________. Please give me clarity, help me to see this situation through your eyes. Give me wisdom on how to approach this and give me the words to say. Heal my wounds and let me know your freedom from pity and hurt. I trust you and I know that you will work this for good because I love you. Please keep my heart from being bitter and angry.